Cersei Lannister is a fictional character in the HBO series – Game of Thrones. She’s the daughter of Tywin Lannister, twin sister of Jamie Lannister and older sister to Tyrion Lannister. 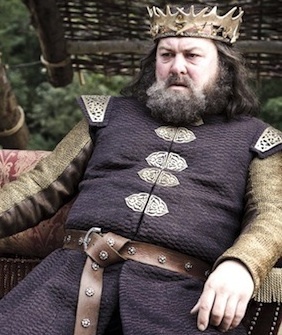 Cersei was married to King Robert Baratheon before she poisoned him to death. She then became widowed and her son Joffery became King of the Seven Kingdoms. Many things happened and she finally became Queen Reagent Cersei Lannister of the Seven Kingdoms. She continues her incestuous relationship with her brother Jamie, but now she doesn’t care who sees it. She’s even pregnant now and is not hiding who is the father. She now rules the Seven Kingdoms, or whatever is left of it to rule. Since becoming Queen she has dressed in dark clothing, has short hair and wears a different crown than the previous kings of the Seven Kingdoms. Her bodyguard is the Mountain. 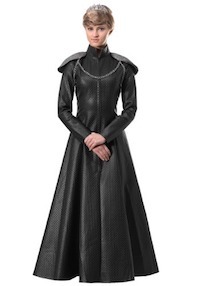 Below are Queen Cersei costume ideas for adults. Click here for more GOT costumes. 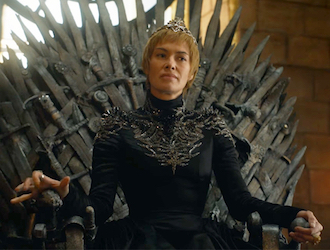 This is an elegant black dress to look like Queen Cersei in GOT – Season 7. This costume is made of faux leather. Winter is coming, or is here in GOT. 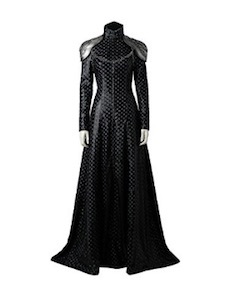 This is a cosplay costume to dress up like Queen Cersei in GOT. 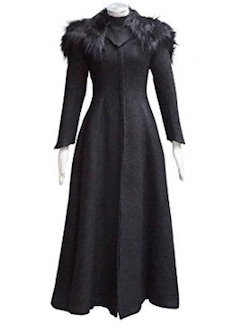 Click here to get the GOT Queen Cersei Winter Dress Costume. 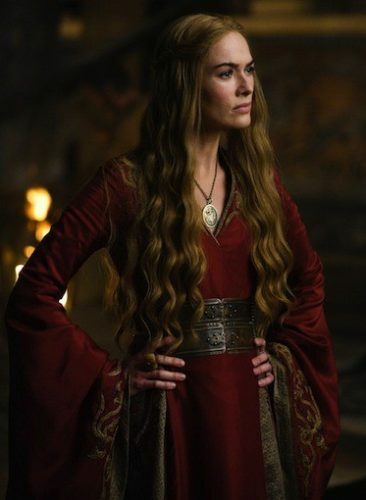 Queen Cersei is must rule with elegance and style. This dress is made of satin and lace. Every queen must have a crown. She doesn’t wear the crown that was worn by previous kings of the Seven Kingdoms. This is a crown made for a lady. Click here to get the GOT Queen Cersei crown. 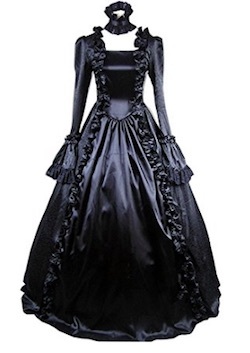 This full-length gown of black luxury is long-sleeved and pleated with a tulle frame underneath to give an elegant shape. The shoulder armor pieces are a foam-backed matte metallic silver with chain trim and a leonine screenprint. Complete this look with your option of a crown, tiara, or scepter of power and watch as the many kingdoms bow to your might! 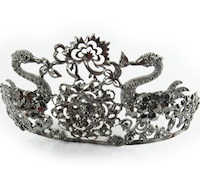 This Black Opera Tiara is about as elegant and intimidating as they come! People won’t know whether to ask you to dance or stay out of your way when you enter the party scene with this lovely tiara atop your crown! 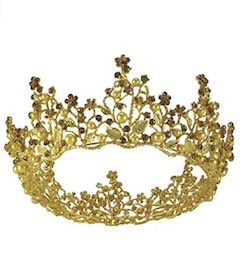 Click here to get the GOT Queen Cersei tiara.